Let me just say this and get it out of the way: This book was beyond amazing! I loved it and couldn't put it down. After all, I started it last night and finished it about ... five minutes ago. I've never read anything by Mandy Baggot before, but wow! I'll have to add her to my list of favorite authors. Especially if all of her books are as great as this one. 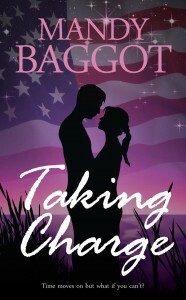 Taking Charge is a novel aptly named. It focuses on Robyn, a young woman who can't seem to run far enough away from her past. So she does the only thing she can: takes charge. And after everything she's been through, readers will have no issues connecting with her, feeling her pain, and hoping that her life will get better. Just her gumption alone will have readers loving her. Even if she talks way too much, is a little snappy, bossy, and over the top. But she's also determined, loving, trusting, and laugh-out-loud-hilarious, even with the baggage she carries around. And trust me, it's heavy baggage. I can't tell you how many times I couldn't stop myself from laughing. And the love interest. Mr. Cole Ryan, yummy, hockey-playing scientist who wants to find a vaccine for certain cancer types. Well, readers won't have any problem falling for him either. The main thing I loved about this novel was the story line. It had so many twists and turns throughout it that will keep readers guessing as to what's going to happen next and to whom it will happen. All characters are set up against different obstacles. It's great to encounter a book where the author makes the supporting character work just as hard as the main characters. Taking Charge called upon so many different emotions, it's almost unbelievable how believable the book is. I was blinking back tears, laughing out loud, and feeling the anger begin to boil. Baggot really knows how to evoke feeling from her readers, for all of the characters in the book, not just the main cast. Outstanding. Just outstanding. WOW! Tracy - thank you so much for that great review! I'm blown away by how much you loved Taking Charge! Robyn is a character close to my heart, so in her honour let's break out the pickles, chips and dips! Fabulous review for a fabulous story! Love it too - sounds like a food fest going on Ms Baggot, I'm up for that! Thank you so much Tracy! You rock! What a great review - this book is a must read - Lady B does it again! "Happy-dance" time. Well deserved, too.